Here . . .our first day was spent being exhausted, but pretty excited to be here. We flew from JFK to Madrid to Barcelona. The airports here are works of architectural genius—in a dazed state, I found myself walking through the airport this morning at 6:00 a.m. on the glass-like black marble floors. We flew in from the ocean and it was amazing—the city is all spread out along the coast—and the sky was clear and the temperature was low 60s. We also flew along the Pyrenees—snow capped and quite imposing. After landing and waiting and fearing our bags were lost on Iberia airlines, we took a van/taxi to Sam’s apartment. It was great to drive into the city which was pretty quiet on Christmas morning. Sam’s place is fantastic! Two bedrooms, a small and cozy living room, kitchen with a bar and 2 stools that divide the room from the living room. He has a really nice bathroom, laundry room and washing machine. He also has a small balcony and an enclosed balcony. He can walk to Sagrada Familia and The Ramblas from his place. We all took showers at his place, then walked all around the city—through the old part, the Gotico, the Roman walls, beautiful squares and Gaudi apartment buildings. I LOVE the city–it is stunning and so well laid out. Hausmann laid out a lot of the city of Paris in a grid and spokes kind of design, and Barcelona was laid out after Paris in the 1800s. The first day was fantastic with tons of walking. We were all just taking it in. Sam lives near a now-defunct bull fighting arena. It is covered with tiles. 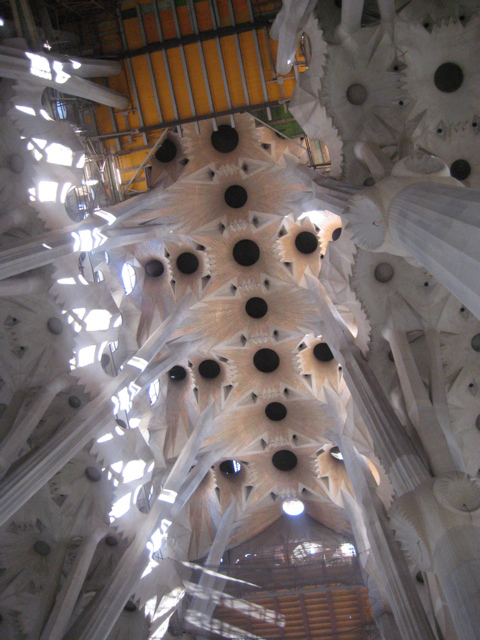 His neighborhood is in a great location–not the Gracia or Gotico, but very close. We walked almost to the ocean but then turned back to have a gourmet dinner back at Sam’s. He made grilled chicken with chistorra (sausage) and roasted potatoes and onions. 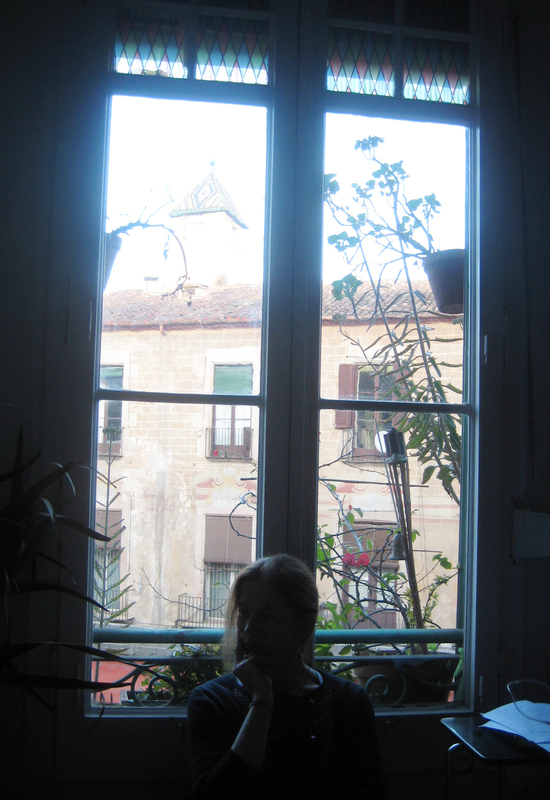 Steve and I are staying in “Simon’s apartment” in the Gotico neighborhood near the Rambla. It is a cool flat, very bohemian. I am basically ready to move here! Plus, one of my favorite designer/illustrator colleague’s lives in BCN. 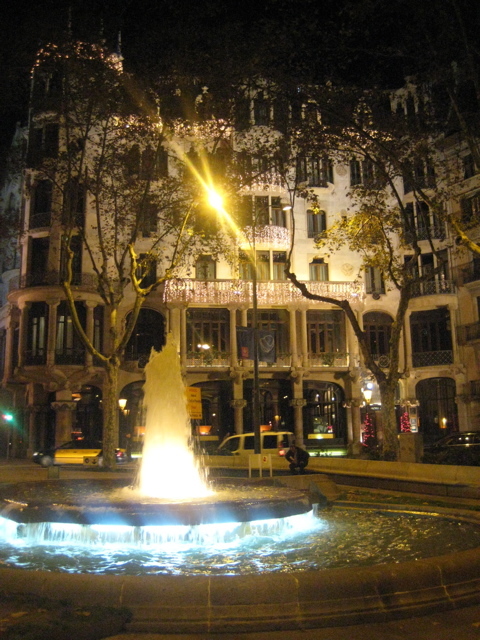 The Gracia neighboorhood with a Gaudi buidling.